First off I’d like to state that the above picture is not one of mine. I took it from the IMDB website because this time I have been too lazy to take my own picture and I thought that this book review should go up sooner than later. I actually finished this book a few weeks ago, but my life has been getting in the way of me blogging. If you haven’t read my last post please do so, it explains at least some things that have been going on. I used to be a HUGE fan of Nicholas Sparks back in 2001 right after A Walk to Remember came out. I read all of his books up to that point and a few after, but lately he had fallen off my radar. When I saw this book in the used bookstore I knew I had to take the chance on him again. I have not seen the movie yet, so my views haven’t been swayed yet. 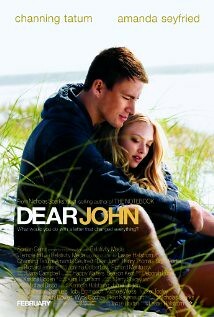 Although it can’t be a completely horrible movie if Channing Tatum is in it. Back to the book…the story is about John Tyree an army solider that returns to his hometown for the summer and realizes that he has changed from his old life. One day at the beach he rescues Savannah Curtis’s purse and falls in love instantly. He and Savannah begin dating and within a few dates John asks Savannah to wait for him until his tour is over, she says that she will. John leaves on his tour of duty and just as he about to return September 11 strikes and emotions are running high throughout the world and the USA. In the heat of the moment, John signs up for a second tour. While, Savannah realizes that signing up for a second tour was the right thing to do, she can’t help but feeling a bit hurt and after a while distance takes a toll on them as a couple and eventually she writes him a letter saying that she met someone else. A few years past and John takes a leave after his father passes away and decides that he needs to find Savannah to close the chapter on their love for each other. What he finds is not what he expects at all. I won’t give you the ending because that would be telling too much of the story. I will say that like many Nicholas Sparks novels this one will leave you in tears and break your heart. It will also show you the meaning of humility, compassion, and real love. If you have not already read this book I definitely recommend reading it and if you have seen the movie at least give the book a chance. Don’t worry I have a few more book reviews to get to you before the end of the year I hope so stayed tuned! * I apologize in advance as to how this post is going to make me sound, but I really thought that you deserved to know. This is a personal post and I am choosing to share a huge part of me with the world. 2012 has been a crazy year for me. I know that I often tell you when things are going good in my real life. I’m not trying to pretend that there aren’t bad times in my life because there sure are. This year has been a long, crazy, stressful year that came biting me in the head in the form of a present. As I have mentioned in previous posts I spent the better part of the year dating KonaBoy. The saddest part to say the least is we have now reached a point where we are taking a long hiatus. I’ll let you interpret that how you will. It mostly came from me acting like a crazy person and struggling to adjust to having someone dependable in my life. Trust me, he’s a great person and deserves the best I won’t deny that. It’s now at the point where I know I don’t deserve to be in his life, but can’t bear to be without him. I know that I also talk very little about my job on here simply because of the nature of it. It wouldn’t take very much sleuthing to find me and I don’t appreciate stalkers. At the beginning of the year, I got a new immediate boss which is great in a lot of ways because I finally have some space to breathe and actually imagine doing things. That has also in some ways made this year hard because my new boss is walking into a new experience and changing things. As many people can relate change is hard and it isn’t easy to deal with all those feelings. I adore my new boss and I know he means well, but I there are days when I just can’t handle being stretched. The thing that brought all the feelings to a head for me came in form of a present. I recently participated in Fat Mum Slim’s Secret Santa exchange. I love giving gifts to people and recently discovered that its one of my love languages. I love seeing my recipients face light up knowing that I saw something that made me think of them. I know that receiving gifts isn’t everyone’s love language and I can’t make it, but please be grateful. I’m getting off track though I was paired up with someone from Seattle and found out some pretty amazing things about her from the discussion group and gave her and sent her an amazing package, although I think that I probably could have done better had I not been so caught up in life. I received my package from my secret santa in the mail earlier this week and to even though I knew it was purchased online I was thinking that it would be the Polaroid Instax camera that I told her I wanted. Instead of receiving the camera I got two shot glasses that I listed on my wish list a long time ago. It’s not that I didn’t want the shot glasses , but they reminded me of KonaBoy and the reason I got them. I felt upset that I didn’t get the gift that I was hoping for. I felt hurt that my secret santa didn’t put more time into getting me something more thoughtful or more insightful. I looked her up in the group and was faced the with the stark reality that she was indeed busy with life and was feeling a bit bad for not doing more. It took me a long time that night to get over the fact that I didn’t get what I wanted, the gift or the thought. I watched a show which I can’t remember now which one it was and it reminded me of all the gifts that had been bought for people throughout the year that would never be given because they were physically there anymore. It made me feel sad because not having someone there at a special time like this there was nothing more important than the season of giving and of being with people who care about you. I don’t even have enough words to really complete my thoughts right now. These past couple of days have been hard and heaven is very full right now. I want to express my gratitude to Senator Daniel K. Inouye for everything he has done for Hawaii and the United States. I apologized for another delayed review on this movie, but life has been getting in the way of this blog. I was lucky enough to see this movie twice. Once with KonaBoy and once with a friend. It was twice as good the second time. This movie was a huge hit for Disney and perhaps its too soon to say that Disney might have it’s magic back?!? This movie is all about video games and being at the arcade,which most children love. The movie takes the normal arcade characters Pac Man, Mortal Kombat, Street Fighter, along with some other video games that they have translated for the movie and turned it into something extraordinary. I have often thought what happens to the characters in the video game once we leave the arcade. This movie takes you inside the arcade once its closed. 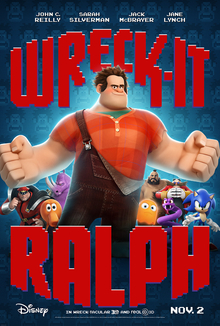 The movie follows a character named Ralph from a game Wreck it Ralph through his long journey to realize that it’s okay to be a bad guy. As you probably know from watching a trailer or two on this movie Ralph is not so happy being the bad guy in the video game and desires to be loved and praised. He goes on a journey for what he believes is to get a medal to come back and show the other people in his video game that he is a hero. Instead on his journey not only does he discover that bringing the medal back was not the important thing, but that he can be a good guy and do good things for people also. He accomplishes good things and becomes a hero to Venelope and her game Sugar Rush when he saves them from total destruction. I won’t give too much away from the movie since I definitely recommend that everyone see this movie. It’s very cute and has some great lessons in it. One of my friends had also seen the movie and related that the Bad Guy Anthem from Bad Guy Anon as seen below was very Buddhistic and I have to agree with her. I won’t go into religion or personal belief too much in this blog, since it is a review, but perhaps in another post I’ll discuss. I recommend this movie for everyone I even loved the graphics in it and I will probably be owning this in my collection when it comes out on DVD or blue ray. I love finishing products and cleaning out my collection. Sorry that this month’s empties is so random. I’m always hoping to have a ton of beauty products to show at the end of the month, but sadly they are never that many. Have you ever done a Project Pan or an Empties video?